Prominent & Leading OEM Manufacturer from Surat, we offer cuno high flow housings, cuno high flow filter, cuno filtration system and drum filters. We are one of the reliable manufacturers and suppliers of a qualitative range of CUNO High Flow Housings. We are offering an exclusive range of Blue Housing that is apt for applications involving different flow rates. These housings are suitable for low flow applications, where high quality housing or industrial pre-filter is required. 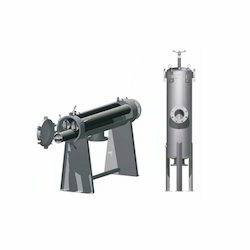 CUNO High Flow Filter are designed using state-of-the-art technology, optimizing both performance and effluent quality to ensure customer satisfaction. The elements use a unique pleat design that results in a high usable filtering surface area per filter. 3M Innovation is at the heart of the CUNO High Flow Filter. 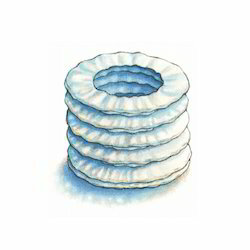 A patent pending compound radial pleat design maximizes the usable surface area per filter. 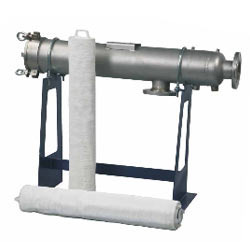 Blown microfiber forms the basis of the filter media, which is made to tightly controlled fiber diameter specifications to produce a media with absolute rated particle retention characteristics. Our unique manufacturing process embosses the media to produce a more uniform pleat pattern, which, in turn, allows greater utilization of the media by evenly distributing the fluid throughout the entire filter structure. This results in consistent particle retention in a compact, space-saving design. The CUNO High Flow Filter contains several features to combine high performance with easy operation. The unique constitution of CUNO High Flow Filters (patent pending) permits flow rates of up to 500 gpm in a single cartridge. The result? Fewer filter elements to accommodate your flow requirements. Infact, the CUNO High Flow Filtration System requires as few as one-tenth the number of elements as competitive 2.5" pleated cartridges (see Figure I). Using fewer elements combined with an outside-to-in flow path enables a reduction in the size of housing required for your application. The CUNO High Row Housing takes up as little as one-half the size of competitive housings for a given flow rate. The result is lower capital investment costs and a compact footprint that saves valuable plant space (see Figure 1). The CUNO High Flow Filtration System is designed with ease-of-use in mind. From a user-friendly, economically designed handle that makes cartridge installation and removal easier without the use of special tools or other hardware, to a unique "twist-to-lock" cartridge sealing mechanism that provides a positive seal, the CUNO High Flow System facilitates easy operation and maintenance of your filter system. Using fewer elements combined with an outside-to-in flow path enables a reduction in the size of housing required for your application. The CUNO High Flow Housing takes up as little as one-half the size of competitive housings for a given flow rate. The result is lower capital investment costs and a compact footprint that saves valuable plant space. The CUNO High Flow Filtration System is designed with ease-of-use in mind. 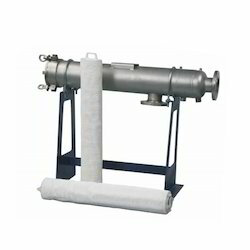 From a user-friendly,ergonomically designed handle that makes cartridge installation and removal easier without the use of special tools or other hardware, to a unique "twist-to-lock" cartridge seating mechanism that provides a positive seal, the CUNO High Flow System facilitates easy operation and maintenance of your filter system. Looking for CUNO Filtration System ?